A galette is nothing more than a rustic tart. Here it a dressed up in slices of pink rhubarb with the crunch of toasted almonds, the richness of butter and a sparkle of strawberry jam on top. In a food processor, grind the almonds into a fine meal. Using an electric mixer, beat the butter with the powdered sugar. Add the flour and the ground almonds and mix until it forms a soft dough. Divide the dough in 4 equal pieces. Press the dough pieces into flat rounds and wrap in plastic wrap. Refrigerate until firm. Roll out dough on a floured surface into rounds about 5 inches in diameter. Transfer carefully (the dough is fragile) to a parchment-lined baking sheet. Brush the entire top of the dough rounds with the egg wash. Refrigerate until firm. Mix the rhubarb with the sugar. Place the rhubarb in the center of the dough rounds, leaving a 1 inch edge all around. Fold the edge over and pinch lightly to form a rim to hold in the filling. Brush the edge with the egg wash and gently press 1 tablespoon or so of almond slices along the outside edge of each tart shell. Bake for 20 – 30 minutes until dough is light brown and the rhubarb is soft. When the tarts are done, heat the strawberry jam in the microwave or on the stove until liquid. Brush the liquid jam over the cooked tarts with a pastry brush. 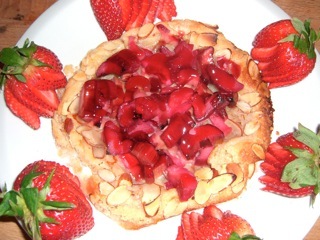 Serve the tarts with fresh sliced or whole strawberries and or whipped cream or dollops of creme fraiche.